A call to Bill Titus at Northrop & Johnson brings news of a currency change from euros to dollars on the 34.14m sailing yacht Song of the Sea. 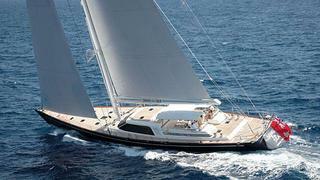 Built by Nautor's Swan in 2002 to a German Frers design, Song of the Sea had a major refit in 2009. Accommodation is for eight guests in a master suite, two twin staterooms and a single cabin with Pullman berth. Power comes from a 414hp MTU engine. Song of the Sea is now down from €5,250,000 to $5,995,000.